retreat. 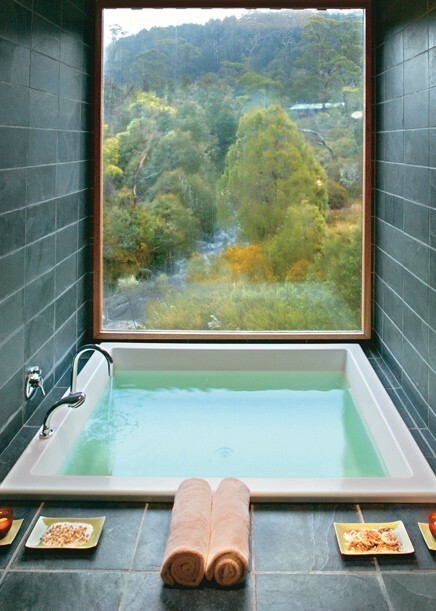 The view looks so tranquil and relaxing. The green slate tiled walls and the wooden window frame are in perfect harmony with the view outside. (Look at that, just from looking at this photo I`m even sounding zen-ny, zen-ish ??!!) The only thing that's got me wondering is what is in those plates? I'm not sure if it's bath products or snacks? :) Love it too. Thanks for commenting Catalina. Who uses their cell in the bathroom the most?